A full time working mom once told me that when summer came she would do some activities with her child. Summer?! Why wait until summer? 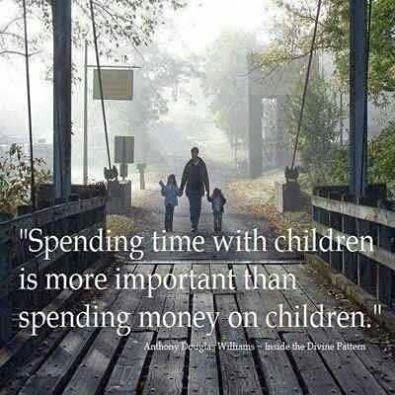 give your child the gift of your undivided time. Maybe it is before or after a meal or at bedtime. Check your electronic devices. Turn off the television. Get rid of all distractors and just enjoy your child! I remember the day I brought home the beat up old coffee table with a Formica top. I had found it at a re-sale shop. I was so excited! My husband gave me a doubtful glance. I assured him that he could sand and re-stain the legs and it would be perfect for the boys and I to play games on. And so it was. That old coffee table provided a play surface for hours of games of cards and board games. Every night after dinner the boys and I would play at least one game. Communication, cooperation, sportsmanship, math concepts, strategy and logic were all learned at that table. We had FUN! We got to know each other and the evenings were meaningful and created fond memories. After the bedtime routine, each boy would retire to their beds and I would plop down in the big old stuffed chair in their room. Then we read books. When they got old enough, they read to me! We progressed from plastic picture books to chapter books over the years. Sight words, memorization, spelling words all got thrown in there at times. But, the constant was we read together. Devotions and prayer hemmed the evening and contentment and joy were the result. The picture above is not mine. It was discovered on a face book post. Credit is listed under the quote.